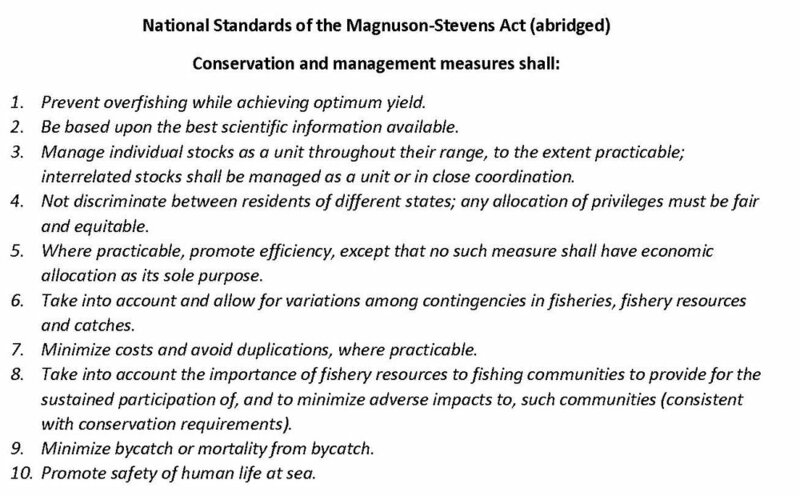 The Magnuson-Stevens Act sets forth 10 National Standards to guide the regional councils in development of fishery management plans (table above). The Magnuson-Stevens Act is the main law governing management of living marine resources in the United States. Originally designed to encourage local-level participation and representation through eight regional councils, the Magnuson-Stevens Act set up a regional fishery management council system and described how it would work. The Magnuson-Stevens Act extended control of U.S. waters to 200 miles offshore; phased-out foreign fishing activities within what is called an Exclusive Economic Zone (EEZ) and created measures to prevent overfishing - and to conserve and manage fishery resources. 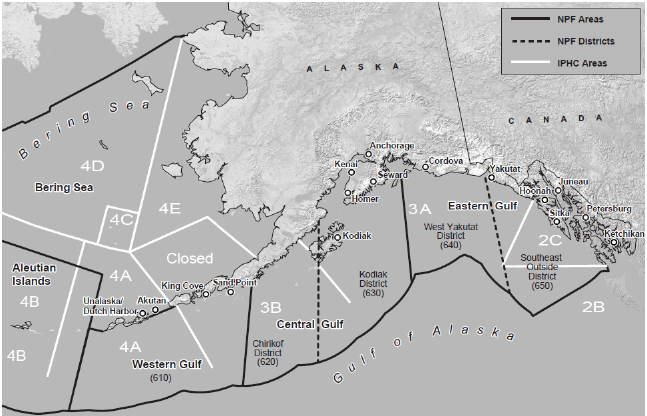 The North Pacific Fishery Management Council is one of eight regional councils established by the Magnuson-Stevens Fishery Conservation and Management Act in 1976 to manage fisheries in the 200 mile Exclusive Economic Zone (EEZ). The Council primarily manages groundfish in the Gulf of Alaska, Bering Sea, Aleutian Islands, targeting cod, pollock, flatfish, mackerel, sablefish and rockfish species harvested by trawl, jig, longline and pot gear. The Council also makes allocation decisions for halibut, in concert with the International Pacific Halibut Commission that biologically manages the halibut resource for U.S. and Canada waters. Actions of the Council must conform with various environmental laws and the above noted Magnuson-Stevens National Standards. The National Marine Fisheries Service (NMFS) is responsible for the stewardship of the nation's ocean resources and their habitat. Its mission charges this organization with the task of providing productive and sustainable fisheries, safe sources of seafood, the recovery and conservation of protected resources and healthy ecosystems. Using the Magnuson-Stevens Act as the guide, the National Marine Fisheries Service works in partnership with Regional Fishery Management Councils (see above for information on the North Pacific Fishery Management Council) to assess and predict the status of fish stocks, set catch limits, ensure compliance with fisheries regulations, and reduce bycatch. NMFS is an office of the National Oceanic and Atmospheric Administration within the Department of Commerce. It has five regional offices, six science centers, and more than 20 laboratories around the United States and U.S. territories. … North Pacific fish harvest accounts for more than half the volume of fish landing in the United States. The International Pacific Halibut Commission (IPHC) is an intergovernmental organization established by a Convention between Canada and the United States of America. The IPHC Convention was concluded in 1923 and entered into force that same year. The Convention has been revised several times since, to extend the Commission's authority and meet new conditions in the fishery. The most recent change occurred in 1979 and involved an amendment to the 1953 Halibut Convention. The amendment, termed a "protocol", was precipitated in 1976 by Canada and the United States of America extending their jurisdiction over fisheries resources to 200 miles. The 1979 Protocol along with the U.S. legislation that gave effect to the Protocol (Northern Pacific Halibut Act of 1982) has affected the way the fishery is conducted, and redefined the role of IPHC in the management of the fishery during the 1980s. Canada does not require specific enabling legislation to implement the protocol. To develop the stocks of Pacific halibut in the Convention waters to those levels which will permit the optimum yield from the fishery and to maintain the stocks at those levels. Convention (1979) - The Protocol amending the Convention for the Preservation of the Halibut Fishery of the Northern Pacific Ocean and Bering Sea. Rules of Procedure (2019) - The Rules of Procedure consist of rules and regulations adopted by the IPHC pursuant to the Convention between Canada and the United States of America. Financial Regulations (2019) - The Financial Regulations govern the financial administration of the IPHC and were established pursuant to the Commission's Rules of Procedure. Close to all taking of Pacific halibut any area or portion of an area that the Commission finds to be populated by small, immature Pacific halibut and designates as nursery grounds. “Convention waters” means the waters off the west coasts of Canada and the United States, including the southern as well as the western coasts of Alaska, within the respective maritime areas in which either Party exercises exclusive fisheries jurisdiction. For purposes of this Convention, the “maritime area” in which a Party exercises fisheries jurisdiction includes without distinction areas within and seaward of the territorial sea or internal waters of that Party.